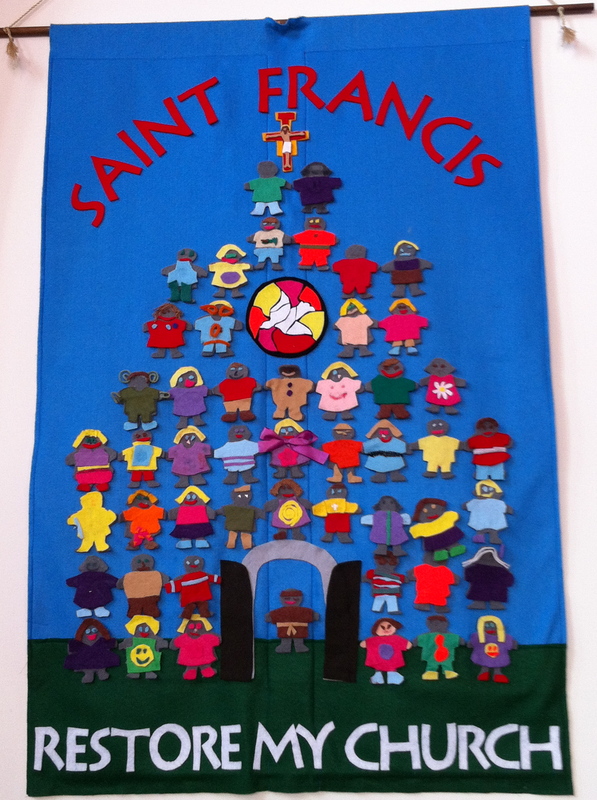 I adore a good felt church banner. “Naaman, commander of the army of the king of Aram, was a great man and in high favor with his master, because by him the Lord had given victory to Aram. The man, though a mighty warrior, suffered from leprosy. Now the Arameans on one of their raids had taken a young girl captive from the land of Israel, and she served Naaman’s wife. She said to her mistress, “If only my lord were with the prophet who is in Samaria! He would cure him of his leprosy.” So Naaman went in and told his lord just what the girl from the land of Israel had said. And the king of Aram said, “Go then, and I will send along a letter to the king of Israel.” He went, taking with him ten talents of silver, six thousand shekels of gold, an ten sets of garments. He brought the letters to the king of Israel, which read, “When this letter reaches you, know that I have sent to you my servant Naaman, that you may cure him of his leprosy.” When the king of Israel read the letter, he tore his clothes and said, “Am I God to give death or life, that this man sends word to me to cure a man of leprosy? Just look and see who he is trying to pick a quarrel with me.” But when Elisha the man of God heard that the king of Israel had torn his clothes, he sent a message to the king, “Why have you torn your clothes? Let him come to me, that he may learn that there is a prophet in Israel.” So Naaman came with his horses and chariots, and halted at the entrance of Elisha’s house. Elisha sent a messenger to him, saying, “Go, wash in the Jordan seven times, and your flesh shall be restored and you shall be clean.” But Naaman became angry and went away, saying, “I thought that for me he would surely come out, and stand and call on the name of the Lord his God, and would wave his hand over the spot and cure the leprosy!” Are not Abana and Pharpar, the rivers of Damascus, better than all the waters of Israel? Could I not wash in them and be clean?” He turned and went away in a rage. But his servants approached and said to him, “Father, if the prophet had commanded you to do something difficult, would you not have done it? How much more, when all he said to you was, ‘Wash, and be clean?’” So he went down and immersed himself seven times in the Jordan, according to the word of the man of God; his flesh was restored like the flesh of a young boy, and he was clean. I don’t know about you, but I wasn’t super-familiar with Naaman. A distant cousin in our family tree, he’s not a Bible character I heard about. But I’ve grown fond of the utterly human Naaman. Naaman seems to have it all- military might, the favor of the King of Aram, servants and riches. But he’s got a bit of a skin condition, not so bad that it prevents him from social interaction but it’s embarrassing. People notice it. Naaman notices it. The text uses leprosy here as a sort of catch all phrase for a range of possible skin conditions. Nice house, good family, high regard of the political class, professional success, and acne. He has veteran’s healthcare from the King of Aram and nothing has cured him. No need for a referral to a specialist. Nothing but the best care for you, Naaman but it still hasn’t healed him. He wants to something to heal him. We want to believe that the things will heal us. Face cream made from diamonds, water from bucolic springs, work out videos from famous people. And we’re willing to pay to be saved. We want to believe and we’re willing to pay. Sports drinks that will give us back our energy, razors with five blades to make us into football players, scents from canisters that magnetically draw people to us. Let me testify, I am not immune to the temptation of a magical fix. I had a few days to spare after a friend’s wedding in Memphis before a work meeting in Cleveland and decided to explore Arkansas. I stayed in Little Rock and took a day trip down to Hot Springs, an entire city built around the hope that hot water can cure whatever ails you. Presidents and pilgrims, even the Red Sox team went to Hot Springs in the early 1900’s. And so, at the cost of $64 dollars without tax and the plus the price a rental car, I found myself at the 1912 Buckstaff Bathhouse, being whisked in and out of tubs of hot water, my dignity left back in the locker room with my clothes. And there I sat, in a metal steam box (the local ladies called it a vapor cabinet) with nothing but my head sticking out. We want to believe and we’re willing to pay to be saved. Naaman’s caravan leaves the land of Aram, drives past Hot Springs and straight to Israel. He’s prepared. He’s over-packed. The scripture says he has packed “ten talents of silver, six thousand shekels of gold, and ten sets of garments” and a letter explaining his visit to the foreign king. Naaman is prepared to buy his salvation. The cost and the inconvenience are high. The ten talents weigh about 750lbs, the shekels another 150 lbs. Anyone who has weighted in the airport check-in line with bulging bags knows that feeling of embarrassment and dread of having over-packed with things you just don’t need. He’s brought everything he possibly could with him that he could use to buy his healing. Naaman is flush with material wealth, but this is not the economy of God’s salvation. Healing is not bought with talents and shekels and garments, or cars or investment portfolios or gadgets. But the temptation is high to pack our bags heavy with the things we think could save us. Naaman’s impulse is understandable. We long for the economy of God, but are resident aliens in the land where the billboards of Mammon and spam email promise that our houses, our credit cards and our stuff will save us. Naaman’s comfort hasn’t saved him so far, but he still can’t shake that impulse to over-pack. He’s got an expectation of where healing will come from and how he’ll fund it. Naaman is insulted on every possible front. Naaman is a general of high standing, and a simple prophet won’t invite him into his home. Naaman arrives with a giant entourage and is greeted by a servant. Naaman presumes how his healing will occur, but Elisha doesn’t come out to wave his hand over Naaman’s skin. Naaman is expecting to pay greatly for his healing, and is told to do something ridiculous and free. Take off your clothes, Oh mighty general and dunk yourself in the waters of the Jordan seven times. Even more offensive, do it in your enemy’s waters. Naaman is an extreme version but his impulses are familiar. Over-packing, over-prepared, fairly sure we know where God’s healing will come from and what it will look like. We want to be healed and we are willing to pay. We take God’s free and free flowing offer of love and try to brand and bottle it like water. As Americans, we are a people who participate in the 8 billion dollar bottled water industry, outselling coffee, milk and beer- just behind soft-drinks. We pay for the promotional materials. We pay for the perceived convenience. Bottled water is 40% tap water. After 4 years and testing 1,000 bottles of water, the National Resources Defense Council found that bottled water was no safer, no cleaner, no healthier than the water that comes out of your tap. We want to believe in things that we can buy will heal us. Bless Naaman, who finally realizes his wealth, privlege and presumptions won’t save him. Bless Naaman, who listens to his servants who say Naaman, listen, “if the prophet had commanded you to do something difficult, would you not have done it? How much more, when all he said to you was ‘wash and be clean?’” Bless Naaman, who swallows his pride, leaves his clothes and his riches and his comforts by the shore side and plunges into the water. In front of all of those people, exposing his scarred skin- the very thing he had worked so hard to hide. He leaves behind the money and the armor that couldn’t heal him and plunges into the deep. Did it work yet? Two times- Why am I doing this? Three- look at all the people staring at me. Four- this is ridiculous. Five- I could have done this at home in my own rivers. Six- I have nothing to lose. Seven, he throws up his hands and acknowledges, “I can’t save myself.” This is our life of faith- giving up on the stuff and status that we think will save us. Doing that simple thing again and again until it has meaning. Coming to the table and eating the bread, again and again and again until it becomes the body. Saying the words again and again and again until they become true. Showing up to prayer again and again and again until we can believe. But we like bottled water. We like the comforts, the image, the cost. All our special packaging, different labels: Fiji, Poland Springs, Aquafina, Presbyterian, Perrier, Methodist, Evian, Episcopalian, Orthodox, San Pelegrino. But, beloved it is all water- and the truth is that when thirsty people are offered water, they don’t ask “Is it Perrier?” And when broken people are offered love, they don’t ask “Is God’s love Presbyterian?” When we are baptized into the one body of Jesus Christ, we are all baptized with the same water. We are baptized into the one Church, and as much as we want to divide those waters up, they keep flowing back together. This is the work of all the baptized. To get humble like Naaman, to risk jumping in the waters of salvation. God’s love is free and free flowing. We want to make it expensive and difficult. Ditch the bottled water. Drink deeply. May it be so. Amen.